The natural tendency when responding to a spatial pattern is to map that pattern directly to your fingers. So, for instance, you would naturally tend to press the left button when responding to the left-most dot in a pattern. If you were told to press the right-most button instead you would need to use willful action to make that happen. The study measured brain activity while volunteers used an easy (compatible) mapping (see left portion of figure), and separately measured brain activity while they used a hard (incompatible) mapping (see right portion of figure). 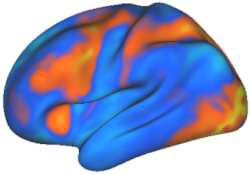 A number of brain regions were involved in the hard mapping versus the easy mapping (i.e., when willful action was necessary). These included dorsal prefrontal cortex, premotor cortex, insula cortex, and parietal cortex (among several others). This set of regions has been previously called the cognitive control network (Schneider & Chein 2003). These regions are consistently involved in tasks requiring willful action (and cognitive control in general). The study was specifically interested in which brain regions are involved in preparation for willful action (and, in this case, overcoming spatial incompatibility). Before each spatial pattern a cue appeared such that the volunteers knew if the upcoming pattern was going to require willful action or not. By looking at increases in brain activity for the hard versus the easy cues we could infer which brain regions were involved in preparation. The study found that the same brain regions that are involved in willful action are also involved in preparation for willful action. This could mean one of several things. First, the network of regions involved in willful action may be a general cognitive control network (as suggested by Schneider & Chein), such that any non-habitual thought (including preparation) will involve these same regions. Second, preparation may simply be a matter of imagining (simulating) the future action, such that the same regions are active during these simulation events. I am of the opinion that there is a single cognitive control network within cortex that is involved whenever willful thought or action (including working memory) is necessary. There are many situations in which only parts of this network are involved, which reflects the specialized nature of the network's components. However, this network is more often active as a whole than in parts (see Wager & Smith 2004). One needs to be careful when considering a single region or network as underlying all willful thought and action. My claim is not meant to be the final word on the neural basis of cognitive control. Instead, it is meant to narrow down the possible places that cognitive control could be localized. Once localization of cognitive control processes is firmly established it will be time to clearly distinguish the roles of each region within the network and, ultimately, to discover the neural mechanisms underlying the will itself. This study is just one of many that are making progress on this front. Your stuff is great, of course. My comment relates to events, that sre not often imaged. I think it the first time I read someone talking on a blog about his last paper. I like it ! More people should do that ! I would be most interested to know if there are viable tests for measuring willful malevolence in the case of a parental tug of war where one parent is trying to use ‘psychic’ fear and control of even psychologists and judges in the custody case! (Spain). I imagine the base is in the imaging (imaginery) system rather than from the fingers in such a situation but perhaps there is some site which can be meausred or observe activity when in operation uder questioning) in the brain. This would be a very valid research area and provide much evidence to courts who struggle with ‘influfences unseen’ or denied. Your comments wouod be most appreciated.